Since 1938, the makers of HABA Blocks have focused on creating quality toys for children. You can find these ingenious blocks in assorted styles, including basic building sets, construction-style building sets, and sets that replicate the Roman Coliseum, amazingly enough. 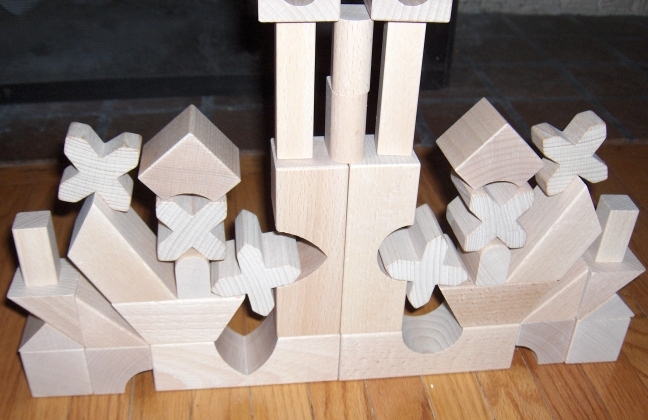 The assorted set of 56 blocks that was used for this review offered two types of X’s, pillars, various squares, triangles, and so many more shapes and sizes – all complete with rounded, soft edges. They were easily stored in the fabric HABA bag that came with them and were easy to see – eliminating any being left behind on the floor. So rarely do we find a children’s toy, or anything for that matter, that offers only pros and no cons, but we find such a toy in HABA blocks. A variety of shapes in easy-to-grasp sizes, a promise of unlimited, imaginative fun ahead, and quality construction are all reasons why no toy box should be without HABA blocks.